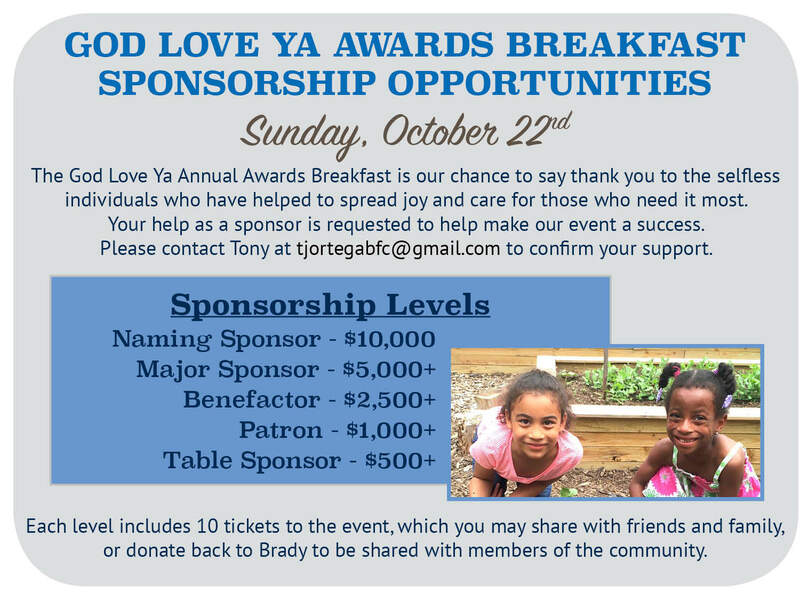 Please join us on Sunday, October 22nd for our 23rd annual Celebration Mass and “God Love Ya” Awards Breakfast. This year, mass will be celebrated at All Saints Church at 9:00 a.m. followed by the Awards Breakfast at 11:15 a.m. at Drumlins Country Club. In honor of their dedication to the mission of Msgr. Charles Brady, we are proud to announce the 2017 “God Love Ya’” Award recipients are Carmelita Howard and The Brady Bread Baking Team. This is our largest fundraiser of the year and is truly a day of celebration. Invitations have been mailed and we are eagerly awaiting your response. If you have not received an invitation and would like to attend this event please contact Trevor Williams at 315-472-9077. Register your space or table. We appreciate and depend on your donations! You can donate any amount for this event by sending a check payable to the Brady Faith Center or use our donation portal. Thank you. May our Lord richly bless you.